I don’t know about you, but I find myself searching for supplements for my dogs more frequently than I would like. At the same time I was searching for Green Lipped Mussels, because someone in a raw feeding group swore by them for pain relief. But buying pet supplements can be confusing. Are manufacturer claims to be trusted? Without a referral or recommendation from a friend, it is hard to know which pet supplements to invest in. Around the time I was searching for natural pain relief options for Junior, Finest for Pets reached out to me to see if I would be interested in trying some of their pet supplements. I was thrilled to take them up on the offer. Finest for Pets manufactures natural pet supplements for both cats and dogs. Founded in 2014 with a mission for improving your pet’s health and happiness, Finest for Pets products are based on over 30 years of pharmacy expertise. With the exception of their fish and salmon oils, these pet supplements are manufactured here in the USA at FDA inspected, GMP certified facilities. A Good Manufacturing Practice (GMP) certification ensures that pharmaceutical products are consistently produced and controlled according to the highest quality standards and with minimal risks. I had the opportunity to try their TummyWorks™ probiotic powder and the TummyWorks™ Chews so those are the products this review is based on. I will say that I was happy enough with these two products, that I am interested in trying their salmon and fish oils at some point as well. 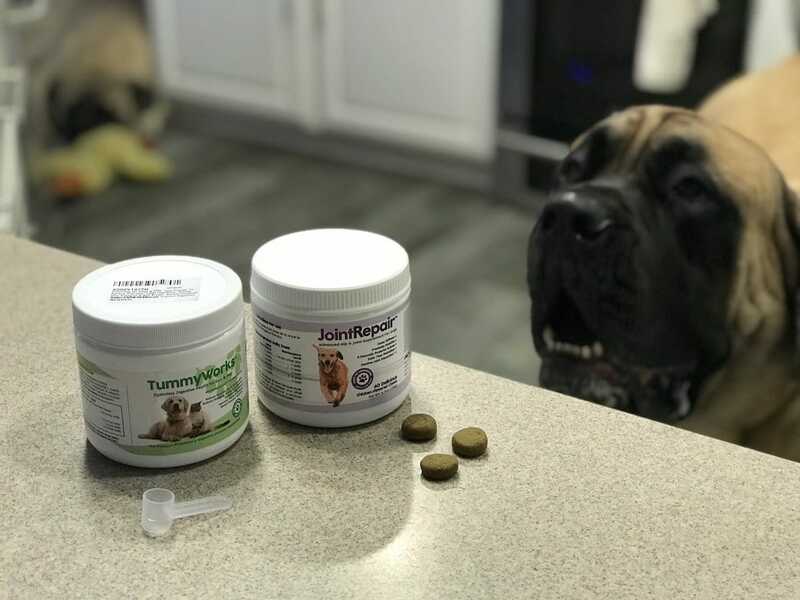 Finest for Pets sent me a container of TummyWorks™ probiotic powder and Joint Repair™ Chews to trial with Sulley and Junior in exchange for my honest review. In this post are affiliate links from which I may receive a small compensation. There is NO ADDED COST to you should you use these links. Thank you very much for your support! In The Top Do’s and Don’ts to Protect Your Dog’s Gut Health on Antibiotics I shared two probiotic pet supplements that I have been using. One of these is TummyWorks™. TummyWorks™ is an all natural blend of 10 probiotics, 6 digestive enzymes, and a prebiotic (to feed the probiotic) specially formulated for cats and dogs. There are approximately 2 billion CFU’s (colony forming units) of bacteria per scoop. In my post about gut health, I wrote at great length about the virtues of probiotic supplementation. Probiotics are live microorganisms (i.e. good bacteria) that, when fed in adequate amounts, provide a health benefit to your dog. With trillions and trillions of microorganisms in his body, from over 1,000 different strains of bacteria, researchers believe as much as 70% of your dog’s immune system is based in his gut. The ratio of “good” bacteria to “bad” bacteria existing in the intestines has a direct impact on how well your dog’s immune system fights off infections and diseases. We want to give that good bacteria a fighting chance and we do that through the use of probiotics like TummyWorks™. TummyWorks™ is a tasteless, white powder that is easy to mix in any type of food. I have mixed it into Junior’s and Sulley’s raw food directly, through inoculated milk, and even mixed in a bowl of kefir. And, while I can’t imagine the powder being a problem, Finest for Pets also makes a TummyWorks™ Chews as well. Below is a short video we created to share a little more about how we are using the TummyWorks™ in our daily raw feeding routine. Near and dear to all of our big dog loving hearts is the importance of joint health. With so much weight bearing on those fast growing bones and joints, it is not easy to create the exact balance necessary for optimal growth through diet alone. Pet supplements like Joint Repair™ can help. Given to dogs with existing joint issues or as a preventative, Joint Repair™ delivers a natural blend of glucosamine, chondroitin, MSM (Methylsulfonylmethane), Tumeric, and Yucca. Together, these ingredients help to relieve pain and stiffness, reduce inflammation, and improve the health of your big dog’s joints. When I received the Joint Repair™ from Finest for Pets, I was immediately impressed by the label. But the ultimate test was Sulley’s and Junior’s taste test as seen in the video above. I would say these chews passed with flying slobber and then some! Never overfeed. Slow and steady growth is the goal. Pay attention to calcium and phosphorus levels in the food you are feeding. You want a 1:1 ratio or close to it. No forced exercise before the age of 12-18 months. Limit time on stairs and slippery floors. No stairs until your puppy is too heavy to carry. What Pet Supplements are You Giving to Your Big Dog? One thing I have found, especially in the raw feeding community, is that the use of pet supplements to fill in gaps in nutrition are common. And whether these are true gaps or just perceived ones, there probably are only a handful of pet supplements that are truly needed. And there are even fewer that need to be given on a daily basis. Joint supplements and, in particular, probiotics, are two pet supplements that I believe are essential elements of optimal health and longevity for big dogs. I have only had the pleasure of testing out a handful of these pet supplements over the years out of the plethora that are on the market, so I would love to know what supplements you are giving your big dog. Do you give a probiotic? If so, what brand and why? What about joint health? Are there any additional cardinal rules that you follow when raising your large breed puppies as it relates to joint health? Please share your thoughts in the comments below and consider sharing this post with a friend if you found it helpful and informative. If, based on this review, you would like to try out the TummyWorks™, Joint Repair™, or any of the Finest for Pets products, the company is offering a special 20% discount on Amazon to everyone in the Big Dog Mom audience. Simply click one of the Amazon links on this page and when you find the product you want to purchase, enter the code BigDogMom on the final “Place Your Order” page in the “Gift cards & promotional codes” box. Click “Apply” and this will automatically apply your 20% discount. If you decide to give these pet supplements a try, I would love to hear your feedback and experience in the comments below.